How many times does one have to re-watch Initial D to catch glitch like this? 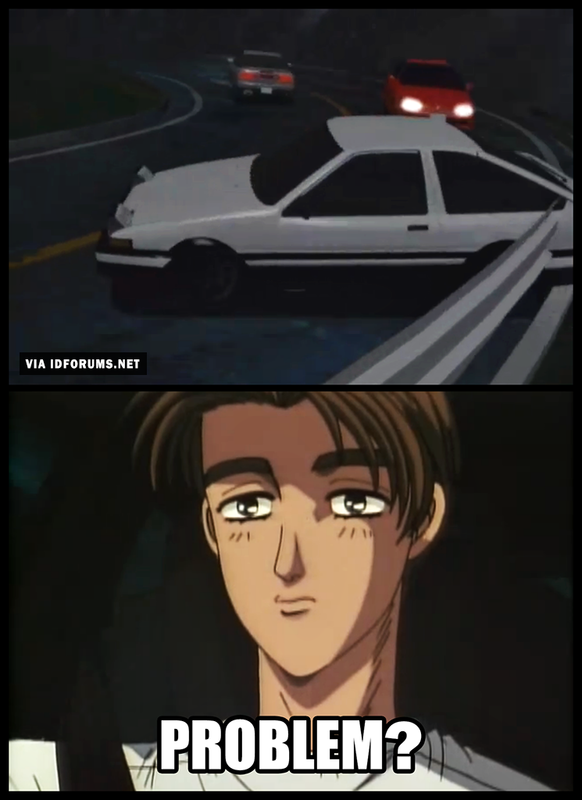 Share the mistakes you find in Initial D with us! We whip up a quick meme for you to enjoy. Feel free to come up with your own. Have fun! » Screenshots from Initial D First Stage Episode 14「進化するドリフト天才!」"Evolving Drift" and Episode 4「交流戦突入!」"Into the Battle!" Image size reduced, original size: 745 x 1024. Click here to view the image in its original dimension. This just in, the armco is the real ghost of Akina. I don't happen to have a screencap handy but in the 86 vs 86 race from Second Stage when Takumi passes Wataru it looks like his side mirror goes right through the side mirror of the Levin. Is the part where the Ghost of Akina turns out to be just a ghost that be ghosting?